"Robots & Microcontrollers for the Future"
The Talrik Jr. Pro was a semi-finalist in the Discover Magazine Editors technology awards! Talrik Junior ProTM: An Inexpensive, Autonomous, Programmable, Mobile Robot for middle school through post graduate college. 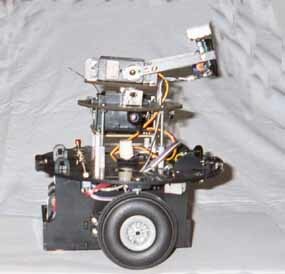 A built TJ ProTM robot offers a sophisticated, expandable, programmable, autonomous, mobile robot with features found on units costing twice as much. (A Price comparison made on 6/25/01 found TJ Pro was priced at 49% below its closest competitor). This is a great robot for beginners and advanced users alike. The more you learn, the more you'll be able to do with this robot. TJ ProTM fits into a right circular cylinder of 7 inch diameter & 3 1/2 inch height. TJ ProTM is constructed from beautiful, 5-ply model aircraft birch plywood, or strong black ABS Plastic (your choice) & rides on two 2.75 inch Du-Bro low bounce wheels & a rear skid. Two high quality ball bearing servos, hacked as gearhead motors & mounted underneath the platform, drive each wheel. TJ Pro has the same physical appearance as his older brother TJTM, but TJ ProTM has a more powerful computer brain than the regular TJ, and offers easier programming options as well as many hardware add-ons. 32 Kbytes of memory (SRAM) with battery memory save mode. 8 analog input channels with 3-pin signal, power & ground headers. 4 digital switch inputs with 2-pin headers(uses one of the analog channels). 5 servo controller outputs with 3-pin signal, power & ground headers. For more software, click here. 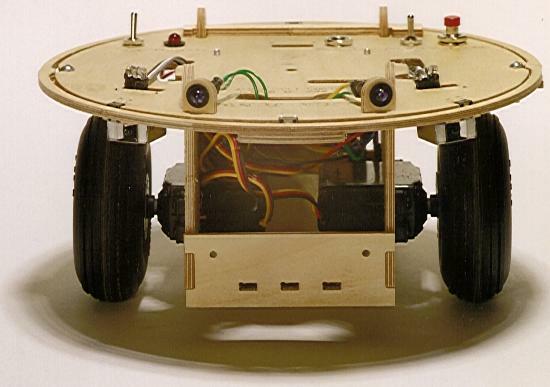 Talrik IV TM An Autonomous, Programmable, Mobile Robot for the serious user. The Talrik IVTM bridge (standard), which spans the robot's central wheel axis, can be used to support a wide variety of pan/pan-tilt sensor heads, radio or IR communications modules, vision modules, servos, additional sensors & multiple micros. For example, the standard kit uses the Photoresistor light-pan-sensor-head. A USBB2325 is required for RS232C serial communication between any PC or Mac & the Talrik IVTM robot. 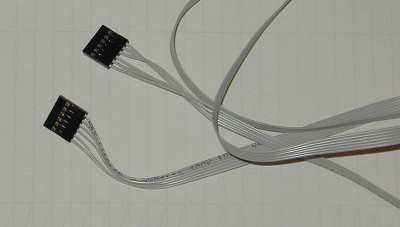 The C2325 six wire cable is also needed to connect the USB2325 to the Talrik IVTM. This serial communications link allows you to upload & download Talrik IVTM data & programs from your computer. Note: Only one USB2325 printed circuit board & one C2325 cable is needed, regardless of the number of MekatronixTM brand robots you own. 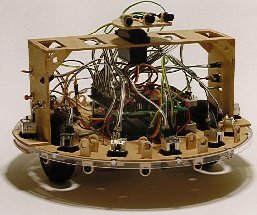 Talrik IVTM provides all the processor, memory, motor, & sensory functions required for a sophisticated, programmable, autonomous mobile robot. There are two manuals: The Talrik IVTM Assembly Manual & the Talrik IV TM User's Manual The Talrik IVTM manuals can be downloaded free for evaluation purposes. All Manuals for MekatronixTM brand products are provided in Adobe PDF format. (Printed, bound copies can be purchased for your convenience). You will need the ADOBE ACROBAT READER to view them. If you do not have Acrobat Reader, you can download it for free by clicking here. For more Talrik IV software, click here. As seen on ABC World News Tonight with Peter Jennings ! 2000 Discover Magazine Editors Awards for Technological Innovation! Each RobobugTM leg is driven by two high quality ball bearing servos to provide two degrees of freedom. One servo provides a sweeping rotation motion from front-to-back & back-to-front. The other leg servo lifts the leg in an up-&-down manner. 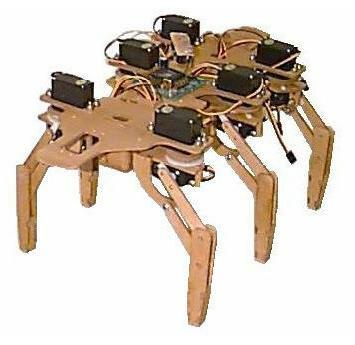 RobobugTM clears more than 3 inches above the floor in its normal stance. At full leg extension, RobobugTM clears about 4 inches. Appropriately timed servo actuation provided by the MekatronixTM brand proprietary walking algorithm provides the necessary intelligence to enable RobobugTM to walk. Auxiliary sensor kits (not included in the base kit) permit you to implement collision avoidance, IR remote control, & contact sensation (momentary tactile switch) at the "feet". You can mount IR detectors & emitters on the front of the robot or on a MekatronixTM brand pan-head (extra servo sold separately). You can write programs to sweep the head back & forth to provide wide angle coverage of the sensors that you mount on the head, e.g., IR, sonar, visible light. 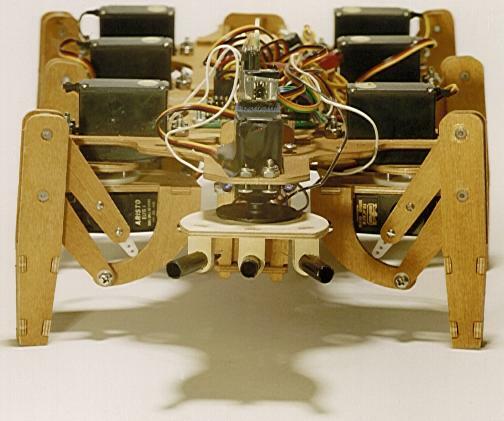 RobobugTM is constructed from beautiful, 5-ply model aircraft birch plywood. The main body is slightly more than 15 1/2 inches long while the body-plus-leg-projection width approximately equals 10 3/4 inches. 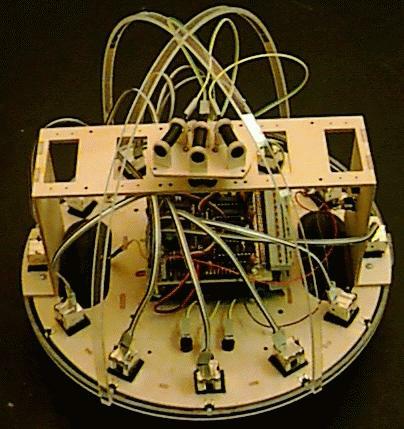 RobobugTM's front section allows the attachment of an optional, servo-controlled, pan head on which sensors can be mounted. Leg joints use nylon bushings to decrease friction. The hollow legs allow sensor wiring to pass from the foot to the "knee" joint without being exposed or susceptible to snagging onto objects. RobobugTM's spinal column furnishes a convenient secure passageway to thread the twelve, 3-wire, servo cables from the legs to the MSCC11 microcontroller. The spinal configuration & "efferent nerve" wires readily yield their source of inspiration! Five NiCad rechargeable C-cell batteries fit into RobobugTM's body cavity to power the servos while a 9 volt NiCad battery powers the electronics. Regular capacity C-cells provide about 15 minutes of walking before recharge is necessary. Higher capacity C-cells can produce twice that amount of time. Click Here for a picture of Robobug with the optional ARGOS/Sonar Head! Software for Robots and Microcontrollers All of these robots and microcontrollers use Motorola's MC68HC11. These microcomputer systems enjoy wide freeware & commercial software support. Freeware & commercial compilers and interpreters are available for C, BASIC, FORTH, LOGO, PROGO and ASSEMBLY languages. Talrik IVTM application packages, utilities, & hardware drivers are written in C. Additional source code examples are available. TJTM application packages, utilities, & hardware drivers are written in C & MC68HC11 assembly language. Additional source code examples are available in TJ Mindstorms & sBASIC. TJTM Pro application packages, utilities, & hardware drivers are available in C, PROGO, Interactive C, or MC68HC11 assembly language. ROBOBUGTM application packages, utilities, & hardware drivers are written in C & MC68HC11 assembly language. Software that permits an external host computer (PC, Palm, etc) to control your robot by sending ASCII character strings to the robot's serial interface. This IR Remote Control Module has everything you need to make your TJTM or TJ ProTM robot a manually remote controlled robot. The robot can be made to follow your commands or go about on his own...it's up to you! You can incorporate comands that change which part of your program the robot excecutes, etc. Module includes: Documentation, TV-type remote control, IR sensor, hookup wire, & sample control program. Available for the Talrik Jr Pro. TV Remote/InfraRed Remote Control Reader. Make your robot read & report what signals your TV remote control puts out. Then program your robot to accept those signals as commands & make your own TV remote controlled vehicle! (This is the program that was used to develop the Remote Control Modules & requires that module for use. See price page for details). Includes Source Code!! IR Reading Software: Read the codes from your TV remote control. Control your robot w/ your TV remote, etc. Also available as a Platform Independent module that includes all the hardware you need to read the IR signals coming from an IR remote. A Great way to learn how to program is to sneak a peek at how the experts(?) do it! Includes program source code & a tutorial style manual in Adobe .PDF format for teachers, hobbyists, & students! Interactive C version available for the TJTM Pro only. Get the ICC11 program sample disk or the I.C. program sample disk or get both! Watch TJTM go from a blind haphazard crazed maniac to an aware & calculating obstical avoiding robot. If left on forever, could he eventually outsmart you? Available for the TJ & TJ Pro. Includes Source Code!! Super Servo Control System: Control 16 servos! Simultaneously control 16 servos using Mekatronixís MSCC11microcontroller. Each servo is updated every 40 milliseconds or at a 25Hz rate, more than adequate for many applications. PROCCED02 / T4SD-CCv1 / TJED01: These are tutorial style program sample disks for the ICC11 C compiler. They include the C source code of many example programs as well as the .S19 code. The programs are broken down and explained in an excellent comprehensive manual. PROICED01: This is a tutorial style program samples disk for Interactive C. It includes the I.C. source code of many example programs. The programs are broken down & explained in an excellent comprehensive manual. TJAIPD / PROAIPD: A state of the art learning program that Includes the previously unreleased source code. PROSERVOCC: External R/C Servo Driver/Control Software. Software to drive up to three servos. Includes Interrupt drivers, extensive calibration routine, servo control, collision look reaction; Includes source code & machine code. (Needs MTJPRO11 board or TJ Pro robot, ICC11 & a PC with a terminal program). TJ MindstormsTM: Use logo on your regular TJ robot. Collision avoidance Program & source code for C or I.C. Robo RacersTM where you can race robots by using any remote and more! ProServo8: Program that allows you to control up to 8 servos on the TJ Pro. The WORLD'S FASTEST HC11 downloader! The 68HC11 High-Speed Downloader v2 (Requires at least Windows 95/98 or Windows NT 4.0) is an ultra-fast downloader for the Motorola 68HC11 microcontroller family that eliminates the headache of trying to use the slow PCBug11 downloader. HSSDL11 is a fully operational 32 bit program that can download Motorola S19 files into your microcontroller's RAM at speeds of up to 115,200 Baud. (Over 10x faster than PC Bug11). And if your HC11 has an EEPROM, the downloader can download up to 30% faster than other EEPROM downloaders. It greatly speeds up the whole programming/debugging process, reducing turnaround times to a minimal. Downloads without locking up your Com port in a seamless windows environment. No extra external hardware is needed to achieve this speed boost. Just run the program, select your code file, connect the RS232 link, & download the code into the 68HC11! For more info and screenshots, CLICK HERE. Memory requirements: 32Kbytes of SRAM is a good minimum. That way you have enough room for I.C. & your programs. Interactive C is an efficient C interpreter for Motorola MC68HC11-based robots & embedded systems. Interactive C's claim to fame is its interactivity & ease of use: users can type in expressions & have them compiled on the fly & run immediately, rather than waiting for lengthy compile & download cycles. Integrated compiler/debugger. You can easily try out C statements & expressions at the commmandline, before writing them into code. Easy-to-use & completely integrated multitasker, with simple syntax, allowing you to write behavioral-style programs. "Persistent" variables, which keep their state in between runs of your software. This allows you to change calibrations or store information that doesn't get wiped out each time you start your code. The ability to use #define macros for more efficient code, yet still type expressions & statements using macros interactively at the commandline. Crash-proof operation. Trying to track down software bugs can be challenging if you don't know for certain that the hardware is stable. With Interactive C, if your board crashes, you can narrow the problem down to hardware. Complete type safety. Unlike typical versions of C which require users to correctly enter function prototypes & external declarations for proper compilation, Interactive C verifies correct arguments for all function calls & types across separate ".c" files. Array bounds checking. Array bounds are verified, preventing writing off the ends of arrays & corrupting memory. A standard windows installation program makes installation easier. Free updates to future versions of IC 3.X. Better integration into the Windows & Macintosh environments. Integrated development environment for Windows & Macintosh, including built-in editor (for those who wish to use it). Integrated C preprocessor, including the ability to use #defined macros at the command line. Standard C features such as structs & multidimensional arrays. The MekArm TM manipulator constitutes a two degree-of-freedom (2-DOF) planar robotic arm with an actuated, parallel-finger gripper, all driven by servomotors under control of a robot. The three, independent, servo-driven motions, starting at the base, are called the shoulder joint, wrist joint and the fingers. MekArm TM mounts on the TJ Pro TM robot to provide a 4-DOF manipulator with gripper, a total of five degrees of motion. The wheels of the robot provide two degrees of freedom in the plane of motion of the robot. The plane of motion of the forearm and end-effector is perpendicular to the floor and the gripper finger motion is parallel to the Floor. Click here for the MekARM movie. The ARGOS hardware is the same for all the robots, but the software is different for each robot. plus assorted resistors, wire, connectors, screws, nuts, standoffs, bolts, washers, etc. For more information, download the ARGOS manual for free! 2. 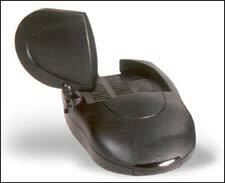 ARGOS VIDEO CAMERA: Just add a CCAMNTSC to your order and mount it on top. 3. ARGOS WIRELESS: Just add a RF232KIT to your order for wireless communications. (Coming soon!) ARGOS LINE FOLLOWING: Line following circuit and software, autonomous recharge circuit (allows robot to recharge itself!, passive "mouth" with two microswitch detectors. Wireless RF serial communication between your robot and any PC or between any two PCs with serial ports. Up to a 3 mile range! Make your robot a SPY with this remote Color mini video camera with audio! Above is the NTSC version of the Mini-Color Camera w/ transmitter in the enclosure. Explore worlds inaccessible to you, but not your robot! This self-contained wireless Color video module mounts on top of almost any robot. You can easily mount the camera & radio transmitter on the Talrik IVTM & TJTM, for instance. Transmit a 2.4 Ghz video & audio signal to your TV, VCR, or video capture board. It has 4 channels so you can have up to four cameras running at the same time. You can view the live Color transmissions from your robot's perspective while it explores "dangerous" environments or environments not normally accessible to you! Auto Shutter 1/60 to 1/15,000 sec. Click here for info on the PAL version of the Projection RealityTM Module ! 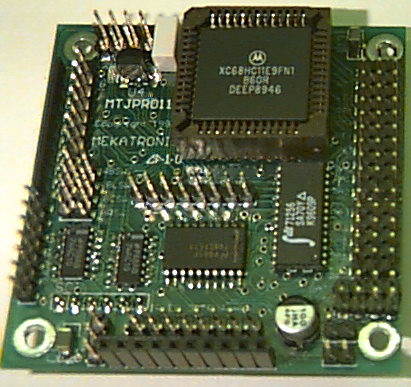 The MekatronixTM brand MTJPRO11 is one of the best 68HC11 Microcontrollers you can buy for its price range. It has more features than Motorola's EVBU (Yes, even when you add the ME11 expansion board to Motorola's EVBU, the MTJPRO11 comes out on top). This board has a broad range of applications. Any project requiring a small, embedded microcontoller will find the MTJPRO an ideal solution. Size: 2.5 inches by 2.5 inches. Total of 8 analog input channels with 3-pin signal, power & ground headers. 3 digital inputs/input capture inputs. 8 bits of digital output capable of driving a total of 75ma continuous current. A single output can drive as much as 35ma of continuous current. A 8 by 2 pin header array in series with the 8 digital outputs & 8 pull-up resistors. 4 memory-mapped digital input & 3 memory-mapped digital output enables with 7-pin header controlled by the R/W line & E-clock of the MC68HC11 processor. A stable, crystal-driven, 40Khz clock to modulate IR & sonar. 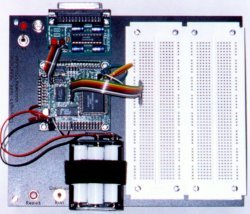 An 8 pin header making the microcomputer data bus available for external use. Mode switch header, power switch header, reset switch header, battery power header, power-on Red LED header, battery charge header. MindStamp, consisting of a MC68HC11 microcontroller and serial communications board, is an ideal electronics project prototyping system, especially when used with Interactive C (IC) software. No need to buy expensive power supplies! The system runs on 6-AA rechargeable NiCd (sold separately) and connects to a Personal Computer COM port. Eight 3-wire (5volts, ground, signal) powered analog or digital input header connected to Port_E. Eight 3-wire powered digital output header connected to Port B. Eight 3-wire powered bi-directional digital signal header connected to Port C.
Jumpers to separate unregulated & regulated power & ground rails on the headers. The power rail can drive up to 16 servos attached to Port C & Port B headers. The regulated voltage rail always drives the microcontroller & the eight powered digital/analog inputs attached to Port E.
Eight 3-wire powered analog sensor connectors may be attached directly to Port E.
The USB2325 module permits the user to physically connect a USB serial communications cable to a six wire, 5 volt serial communications cable. Applications include serial communications between a personal computer's USB port via a USB2325 to any robot or microcontroller that provides serial communication at logic voltage levels (+5 volts & ground). In other words, this product converts the standard PC & Mac USB serial signal to the 5v standard that is used in microcontrollers. The MS492 & MS1275 can be used as a servo for actuating the joints of robot arms, legs, & hands. User modification permits the MS492 & MS1275 Boss to serve as a reliable gearhead DC motor useful for driving robot wheels & other mechanisms requiring continuous rotary motion. This modification is detailed in the Talrik IVTM Assembly Manual. A modified MS492 & MS1275 Boss runs at 45 rpm & often outperforms gearhead DC motors costing much more. A 3in. DU-BRO wheel mounted on the MS1275 Boss or MS492 output shaft, will propel a vehicle at a respectable 7 inches per second. For even faster motion, try the MS900 Turbo. The MS492 is the servo of choice for Mekatronix brand robots, while the MS1275 Boss is available as an upgrade for those who need a heck of a lot of torque, and the MS900 is available for those who need more speed. .16 sec 4.8 to 7 volts Standard Servo, Ballbearing for longer life, replaces HiTec HS422, Futaba s148 or equiv. You can get the body only kits for all the robots we sell. They come at different levels of quality. When you buy a body, it comes in a pre-cut sheet in which the parts "punch out"
H-Body: Bodies with this classification are of premium 5 ply model aircraft birch plywood and are perfect for the quality minded. This beautiful wood is standard on all Mekatronix brand complete robot kits. ABS-Body: Bodies with this classification are of premium ABS plastic and are perfect for the quality minded. 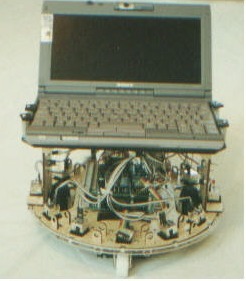 This ABS can be substituted on most Mekatronix brand complete robot kits. What's the best body type? --> Actually it's a toss up between the H-Body and the ABS-Body. It just depends on your person preference. Both the tan Wood and the black ABS make strong durable robot bodies. 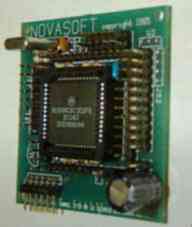 Click here for a list of Robot & Microcontroller Books for sale. Go Back to the Top of this Page by clicking here. Copyright 2014 NovaSoft TM, Inc & Mr Robot TM, Inc.